You’ve been spurned. Knocked back. Shown the door. 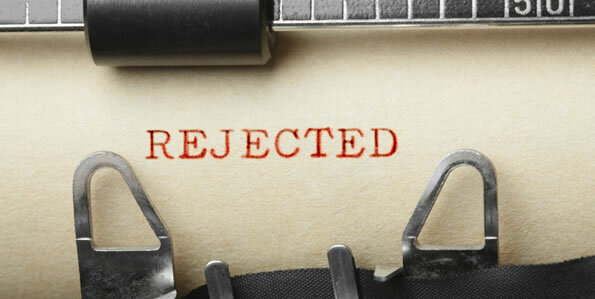 Yes, I’m talking about the perennial companion of every budding writer: rejection. It’s as constant as the flow of caffeine, as ever-present as the buzzing sound your printer makes as it spurts out words you’re suddenly uncertain of now they’re in cold black and white. It’s hard not to feel knocked down by it, especially as you’ve undoubtedly spent a hell of a long time crafting your story, pouring your heart and soul into it, and this is all you get in return? That’s the type of cruel brevity that even Hemingway wouldn’t have attempted. It’s interesting to compare the writer’s expected response to rejection with the response expected in other areas of life. For example, if we’ve been rejected by a lover, it’s assumed that we’ll go through a period of heartbreak and mourning. In fact, it would appear strange if we didn’t. After all, about 90% of pop songs are about heartbreak, so that’s a hell of a lot of wallowing goin’ on. But if we writers suffer a rejection, we’re supposed to get up off the floor almost immediately, brush it off and carry on. We’re expected to have thick skins, hard shells, an impervious outer coating. It’s the only way to survive and retain the strength to keep plugging away, but it seems a bit unhealthy to me. It would probably do us the world of good, after which we could arrive back at our desks ready to take on the world afresh. Of course, it’s also good to laugh the rejections off. After a while they can become like badges of honour, and we talk about ‘papering the walls of the spare bedroom’ with all our rejection slips. They’re like war wounds we’d rather not have but are secretly proud of, battle scars that serve as proof of our bravery on the front line of the literary battlefield. Or something. I say it’s a comforting truth because if you receive rejection after rejection and still carry on writing, then you are officially a writer. Even if you don’t get published, you’re still a writer. And if you carry on scribbling away, and study other writers’ work and learn from it, you’ll get better at your craft and eventually you will get published somewhere. It’s true. Anyway, I’ll leave you with the best response to artistic rejection I’ve ever heard. Noel Coward was dining alone in a restaurant when who should walk in but notorious theatre critic Kenneth Tynan, who just days earlier had trashed Coward’s latest play in a most spectacular fashion. Sublime. He managed to take the bad review of his play with good humour while turning the tables on Tynan and elegantly regaining the upper hand.